H Peel, the Northern Bear company that specialises in the design and installation of commercial interiors, has appointed a new director as part of a planned succession process. Russell Crowther has been made Contracts Director and will be working alongside Joint Managing Directors Dominic Brogan and Andrew Pollock. 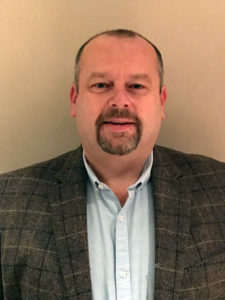 Russell started at H Peel in 1994 as a site joiner and has worked his way up through the company as Contracts Supervisor, Contracts Manager, Senior Contracts Manager and now Contracts Director. Northern Bear plc acquired H Peel & Sons Ltd in July 2017. For over 50 years H Peel has been responsible for transforming the interiors of many major breweries, universities, student unions, hotels, health clubs, schools, care homes and offices in the UK. Russell Crowther is especially proud of the work done in the last few years at Virgin Active Health Clubs in London. Russell, aged 50, lives near Bradford with his wife and two teenage children. He is a coach at the local rugby club, where his daughter is a star player.